The Sun has published video of Wayne Rooney boxing Sunderland defender Phil Bardsley in his kitchen. 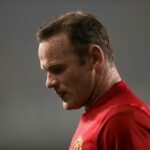 The impromptu showdown reportedly came the day after Manchester United’s loss at Swansea last month. Rooney and former Man United teammate Bardsley can be seen wearing boxing gloves and wearing only socks on Rooney’s slick kitchen because what could possibly go wrong? The pair exchange a few punches and mimic the little details that real boxers do when not fighting in an expensive kitchen, but then Bardsley catches Rooney square in the face and the England captain goes down like Man United without Sir Alex Ferguson. Or England at a World Cup. Or Rooney trying to win a penalty against Preston North End. The video ends with Rooney flat on his back, making it look like he’s out cold, but Bardsley’s wife Tanya says this makes the incident appear more serious than it was. Meanwhile, the person who really deserves to get knocked out is whoever sold this video to The Sun. Rooney responded to its release with good humor, though. After scoring Man United’s third goal against Spurs, he reenacted his kitchen boxing experience, complete with the KO.